Matt Niskanen saved the Washington Capitals from adding insult to injury, scoring quickly in overtime to lift the Caps to a 3-2 win over the New Jersey Devils, to whom the home team surrendered the game-tying goal with an even 30 seconds left in regulation. For what seemed like the millionth time (okay, actually the fourth, and final time of 2014), the Washington Capitals played the New Jersey Devils. This time, it was the bookend of a three-game road trip, in which the Caps were 2-0-1, the only black mark being a 20-round shootout loss to the Florida Panthers. The Caps are 6-0-2 in their last 8 games. Not shabby. Braden Holtby pitched the shutout in the 4-0 win, propped up by goals from Mike Green, Alex Ovechkin, and two from Nicklas Backstrom. First star: Braden Holtby. He’s 6-1-2 in the month of December. Holtby stopped 21 shots in his second shutout of the season, his 14th win of the year. Second star: Nicklas Backstrom. Backstrom scored his ninth and tenth goals of the season, and assisted on Mike Green’s game-winning goal. He leads the team with 34 points (10g, 24a) and has collected seven points in his last four games. He’s ranked fifth in the NHL in assists. Third star: Alex Ovechkin. Held to 4 games without a goal, he was overdue for one, and what a stunner it was. The goal was his 15th of the season, and Ovechkin has 4 points in his last 4 games. It was a sleepy game to start in New Jersey, but Alex Ovechkin opened everyone’s eyes in the third period with a highlight reel goal to finish off the Devils. Two wins isn’t necessarily a streak, but the Capitals have that many in their pocket as they head to Tampa, fresh off a 4-1 win in New Jersey. Goals from Jay Beagle, Karl Alzner, Evgeny Kuznetsov, and Brooks Laich, plus a strong performance from Braden Holtby pushed the Caps past the Devils in the second game of their three-game road trip. First star: Braden Holtby. Holtby was stellar in the Caps’ win, stopping 33 of 34 shots. The only goal he allowed was a puck that leaked over his shoulder, but Holtby logged his strongest performance this season to date, finishing with a SV% of .971. His empty-net goal attempt didn’t work out, but he’ll probably try to get one whenever he has a chance. Second star: Jay Beagle. The fourth-liner did his best Alex Ovechkin impression and it paid off with his fourth goal of the season, tying his career-high goal total. Third star: Evgeny Kuznetsov. After being healthy-scratched in Carolina, Kuznetsov rebounded with a goal. He led the team in shots on goal with four, and skated 10:26, including some time on the power play. 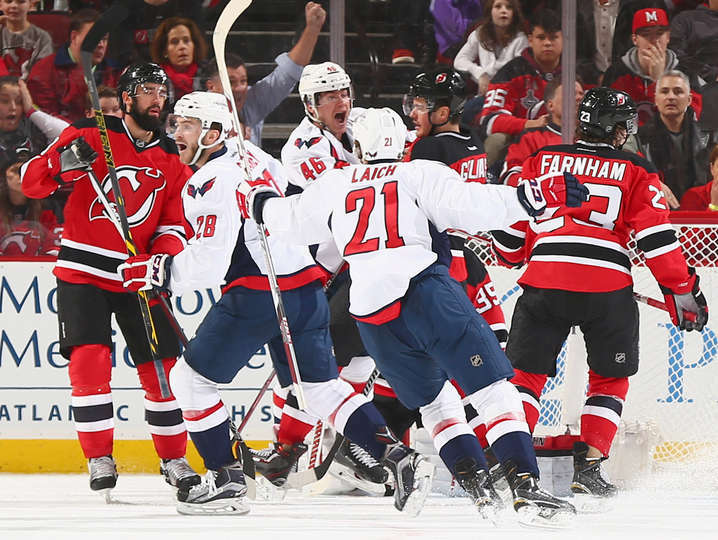 Karl Alzner, Jay Beagle, Evgeny Kuznetsov and Brooks Laich all scored, and Braden Holtby was often spectacular, as the Washington Capitals took care of the New Jersey Devils on the road, 4-1. It’s the first time the Caps (12-10-4) have won back-to-back games in regulation this season. The win allows the Caps to slide into third place in the Metropolitan Division with the New York Rangers loss. Close games are often defined by who dares to make the first mistake. 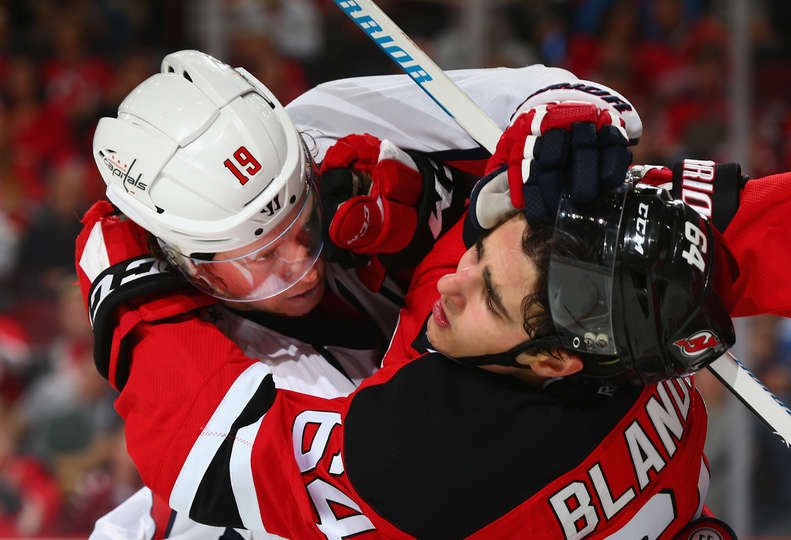 On a slow Friday night in D.C., the Washington Capitals came out on the wrong end of a close game with the New Jersey Devils, excellent at playing the sleepy game, who won 1-0. The defining play was a misplay of the puck behind the net by Braden Holtby. Holtby left his nest to “create a battle,” he told reporters. He was trying to find Marcus Johansson, but was slashed by Jaromir Jagr as he played the puck. “I tried to be patient with my read, and I took too long, probably made the wrong read, and the guy [Jagr] slashed my stick when I went to clear it. At that point in the game, you have to pick the safe play, and I didn’t, and it cost us,” said Holtby. Holtby was forced to let go of the puck, and it caromed to a ready and waiting Mike Cammalleri, who scored the game-winning goal in to a virtually empty net. Brooks Orpik was in front, but he didn’t stand a chance. The Capitals were packing up to head to St. Louis shortly after the game, and the back-to-back game doesn’t give them a whole lot of time to dwell on their bad luck. These types of games are won or lost in a split second. Once again, Holtby is our first star. He made a few ten-bell saves to keep the game close, including a crucial stop on Jaromir Jagr. In the third period, Holtby’s work was supplemented by offense (for once) in the form of three goals. He stopped 26 of 28 shots in the win. It’s only 4 games in, but Johansson is my vote for most improved under Barry Trotz so far. His second period tally was the kind of shot he probably would have passed up last season. Overall, he looks far more confident in his abilities; fast and sharp. Trotz has been good for him. If Ward and Jason Chimera are the heart and soul of the third line, Eric Fehr is the brains. Tonight, Ward was reunited with the brains, and scored perhaps the funkiest goal of the season so far. He chucked the puck to the rear boards behind Cory Schnieder, but it bounced up and to the right of Schneider, behind the goalpost. When Schnieder retreated to protect the goal line, the puck went in. Good goal. Just watch the video.